In Colombia Dia del Amor y la Amistad, or the Day of Love and Friendship, is celebrated on the third Saturday of September. Why not use our service to find a good florist and send flowers to that loved one in Colombia this September 15? Dia del Amor y la Amistad is very similar to Valentine’s Day, which is celebrated on February 14. The Colombian version of this popular holiday has been celebrated in the country since 1969 and dates back to February 14, AD 269, when Saint Valentine was martyred. In fact, the reason why Colombians choose the third Saturday in September over February 14 as the day to celebrate Dia del Amor y la Amistad is because it was determined that observing the holiday on a day other than the one where Saint Valentine was decapitated was more in keeping with values of love and friendship. While not originally a day celebrating love, numerous poets over the years—including Geoffrey Chaucer in his poem “Parlement of Foules”—have popularized the holiday as a time to celebrate romance. Colombians fervently celebrate this holiday and flowers are generally considered the most appropriate gift. In many areas of Colombia it is not uncommon to find restaurants, bars, other businesses and even houses adorned with hearts and similar decorations. Furthermore, in addition to celebrating romantic love, this Colombian holiday is also about recognizing the importance of family and friends. Indeed, while Valentine’s Day in the US, Canada and the UK is generally geared toward couples, you’ll often find groups of friends in Colombia out enjoying a drink and a nice meal on Dia del Amor y la Amistad, which should give you even more reasons to use our service to send flowers to the important people in your life! Even if your loved ones aren’t from Colombia, consider using our flower shops to send them flowers on this very important day. 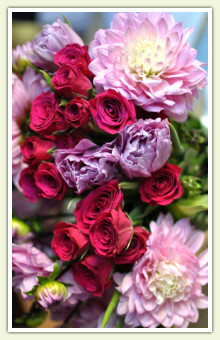 There’s nothing better than surprising friends, family or that special person in your life with the gift of flowers!